Port Melbourne has been a working class suburb just to the south west of Melbourne's CBD. The local football team entered the VFA in 1886 and although the suburb has grown to a town, then a city, Port has always been known as the 'Borough'. Port have maintained a successful club history with 16 premierships and 32 grand final appearances in the VFA up to 2011. During the 1920s the club was consistently in the finals but gathered only one premiership in 1922. The club was not at it's strongest through the depression years on the 1930s, but found form again in 1940 where Norm Goss and Tommy Lahiff helped the team to premierships in 1940 and 1941. 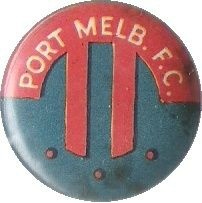 From 1945-58 Port Melbourne were finalists 12 out of 14 years and won premierships in 1947 and 1953. Thereafter premierships occurred regularly with two premierships in the 1960's (1964,1966) , three premierships in the 1970's (1974,1976,1977) and three premierships in the 1980's (1980,1981, 1982).